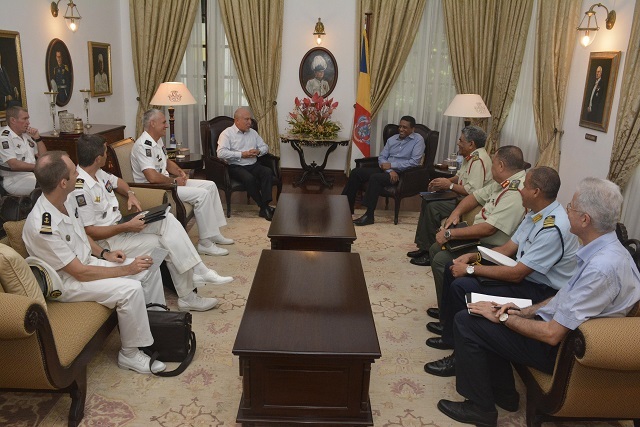 (Seychelles News Agency) - The marine security of the Exclusive Economic Zones between Seychelles and Reunion, a French department in the Indian Ocean, is a topic of common interest for both countries, said a French military officer. The senior commanding general of the French Forces stationed in the South Indian Ocean (FAZSOI), Franck Reignier, met with Seychelles’ President Danny Faure at State House on Thursday. “We have to deal with threats such as illegal trafficking, piracy and terrorism. In regards to marine security, the president has asked us to help in the fight against drug trafficking to which we have positively responded,” Reignier told journalists after meeting the president. He added that there is no legal dispute between France and Seychelles, a group of 115 islands in the western Indian Ocean. The French forces make frequent stopovers to the island nation during the year. It was outlined during the visit that the biggest challenge that both parties face is to find and intervene rapidly to intercept drug traffickers. “We spoke to the president about the set-up of a regional coordination center of operations, within the framework of a European project,” said Reignier. A decision was taken last year to set up such a centre where information collected will be sent to the regional information consolidating center in Madagascar. From there, commands will be given to the nearest vessels to intervene during illegal trafficking. The general added that1.3 tonnes of heroin were seized within the region last year and one of their frigates confiscated 130 kg in one operation. 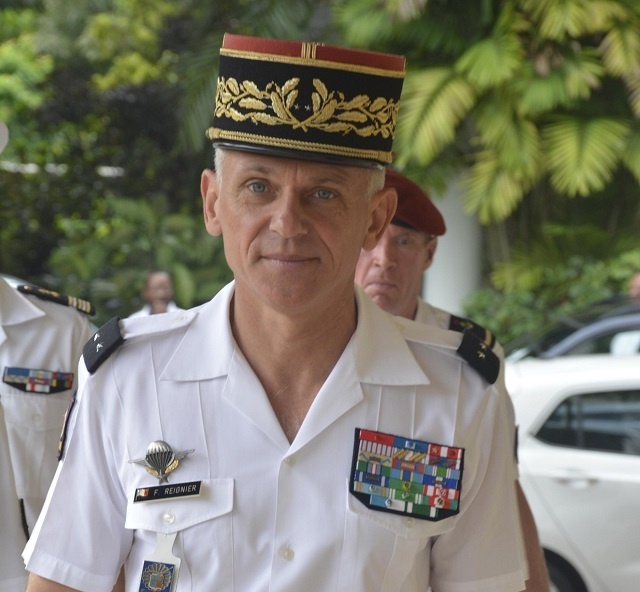 Talking about the bilateral military relationship between Seychelles and French, Reignier said that it is an exceptional and optimal one, where the French military trains around 200 Seychellois military officers every year. This is done locally or on Reunion. “We perform common exercises such as last year's Cateau Noire [Black Parrot] that was held here in Seychelles,” said the general. Drug trafficking was the focus of the Cateau Noire exercise last year, which was part of the military exercise held every two years between the Seychelles and French armed forces. By the end of May this year, the Seychelles People’s Defense Forces [SPDF] is going to take part in a regional military exercise on Madagascar.